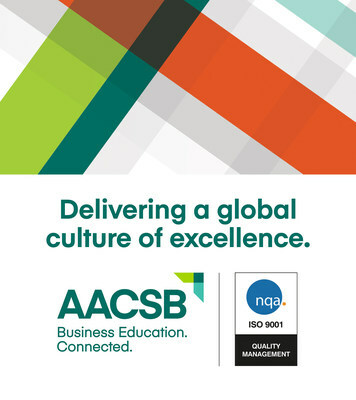 TAMPA, Fla., Feb. 11, 2019 /PRNewswire/ --In dedication to fostering the highest standards in business education, serving as a connector to the global business community, and developing leaders of tomorrow, AACSB International (AACSB) announced today that its accreditation quality management system has achieved ISO 9001:2015 certification for all of its offices globally. With more than 1.1 million certifications issued, in over 178 countries globally, ISO 9001:2015 is the most widely used Quality Management Systems (QMS) requirement offered by the International Organization for Standardization (ISO). Achieving this designation underscores AACSB's commitment to delivering innovative, high quality and customer-focused accreditation services globally. Further, it demonstrates that AACSB's internal processes adhere to a comprehensive, globalized business standard, which ensures a consistency and universal quality experience, regardless of geographic location. "Earning ISO 9001:2015 recognition demonstrates that AACSB's accreditation division utilizes the same quality improvement processes that millions of businesses have embraced worldwide," said Thomas R. Robinson, president and CEO of AACSB International. "This third-party review process mirrors philosophies of our own accreditation standards, and provides AACSB with an internal framework that ensures an elevated quality experience—with enhanced customer satisfaction—for our schools and volunteers globally." To achieve certification, management systems under ISO 9001:2015 evaluation must demonstrate a focus on continuous process improvement and quality control, each of which are key tenets of AACSB's accreditation standards. During the audit, AACSB's internal accreditation processes, as well as its quality management processes, were found to be fully compliant with the standard and earned commendation in the areas of leadership involvement, having well-defined processes, strong IT infrastructure support, and effective internal audit programs. "As the world's largest accrediting body for business schools, AACSB must consistently evaluate how we identify our own metrics for improvement. The strong alignment of AACSB's core values with the underlying principles of the ISO 9001 family reinforced our decision to pursue certification," said Stephanie M. Bryant, executive vice president and chief accreditation officer. "We are confident that this partnership will help AACSB better evaluate itself on a global scale, and will ensure that our processes constantly evolve in a way that empowers our accredited schools to provide the highest-quality education possible." Through annual third-party reviews, ISO 9001:2015 certification will enable AACSB to continue to deliver on its promise of quality assurance while responding to evolving business needs. This method of strengthening AACSB's commitment to innovation and continuous improvement will only better equip business schools, and business leaders, to serve the global communities in which they exist. As the world's largest business education alliance, AACSB International (AACSB) connects educators, students, and business to achieve a common goal: to create the next generation of great leaders. Synonymous with the highest standards of excellence since 1916, AACSB provides global quality assurance, data/research, and professional development services to almost 1,700 member organizations and 800+ accredited business schools. AACSB's mission is to foster engagement, accelerate innovation, and amplify impact in business education. The organization has offices located in Tampa, Florida, USA; Amsterdam, the Netherlands; and Singapore. For more information visit aacsb.edu.